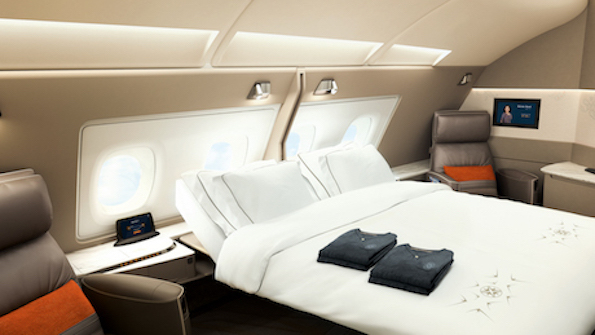 You are at:Home»News»Aircraft Seating»Could SIA’s revamped A380s take Etihad’s crown? Could SIA’s revamped A380s take Etihad’s crown? Singapore Airlines has finally revealed the highly anticipated new cabins for its fleet of 19 A380s, and they don’t disappoint. Indeed the US$850 million investment and four-year development program may just make its A380s the most coveted commercial airline experience, ahead even of the Middle Eastern carriers. Let’s start with the headline act: the first class suites. The biggest news is that the number of suites is being halved, and the new six-suite cabin relocated from the main deck to the front of the upper deck. There have also been several significant updates for the suites, the new versions of which are designed by Pierrejean Design Studio and manufactured by Zodiac Seats UK. Beyond the sliding doors, the look of the space has been significantly altered through the provision of a separate bed and chair, each optimized for its purpose in terms of comfort and function, with no need to convert the bed for eating or working. The popular ‘honeymoon’ feature whereby the beds in the first two Suites of each aisle can be converted to form a double bed also remains, but again with a twist: when not in use, the bed can be stowed completely, creating even more personal space within each suite. The seats are upholstered in Poltrona Frau leather, and are fully adjustable for sitting or lounging, with a swivel capability of between 135° and 270° and recline up to 45°. To ensure optimal IFE viewing, the 32in HD monitor can swivel to suit the different viewing angles in seat and bed modes. The suites also include a full-sized personal wardrobe, a customized handbag stowage compartment, a leather-lined amenity box, a specially designed carpet, and a feature wall with mood lighting. JPA worked with Jamco on the new seat – codenamed Monocoque – a forward-facing, four-abreast (1-2-1) configuration with direct aisle access. The clever LOPA also enables an extra two rows of seats to be fitted in the business class cabin, which the studio says has been achieved without compromising passenger’s personal space. The seat is 25in wide with two side wings for better back support and offers several positions, including a 78in flat bed, and a ‘sun-deck’ lounging position that is great for watching movies on the 18in HD monitor. The carbon fiber composite structure of the seat also forms part of its aesthetic, as Tighe explained, “We have designed the seat as an organic, flowing structure. It’s a super modern form with no gimmicks. The appealing aesthetic is the structure itself”. According to the studio this thinner base structure allows for better optimization of the seat and creates more under-seat stowage space, large enough to accommodate a full-sized cabin bag. This under-seat capacity also enabled the central overhead bins to be deleted in the new business class cabin, which enhances the feeling of space, and saves weight. Other features include a ‘business panel’ equipped with USB ports and in-seat power, reading lights with adjustable brightness level, mood lighting, an enlarged dining table, as well as stowage space for personal amenities. The 44-seat premium economy cabin on the main deck is familiar territory for Singapore Airlines flyers, being the same ZIM Flugsitz product customized by JPA Design for the long-haul fleet and which launched in 2015 on its B777-300ERs. Each seat is 19.5in-wide, with 8in recline and a 38in pitch. Other features include leather trim, a calf-rest and foot-bar, in-seat power, two USB ports, an in-seat reading light, a cocktail table, and a 13.3in HD monitor. Recaro’s CL3710 model has been selected for the 343-seat section on the main deck, which will also be used on the airline’s Boeing 787-10 and Airbus A350 fleets, making this a rather lucrative order for Recaro at more than 18,000 seats. The design has been tailored for Singapore Airlines with a customized seatback, special padding, an amenity holder below the IFE monitor, a vanity mirror integrated into the back of the tray table, and additional stowage pockets for personal items. High-speed in-flight wi-fi wil be ensured, as Singapore Airlines will have the world’s first GX-enabled A380s. The aircraft will be equipped with Inmarsat GX Aviation’s broadband connectivity system, offered through SITAONAIR. Currently available on selected Boeing 777-300ER aircraft in Singapore Airlines’ fleet, this service will be progressively introduced on aircraft that are equipped with SITAONAIR’s Internet and mobile in-flight connectivity. The new A380 designs are a fantastic update to the Singapore Airlines passenger experience, and redistributing much of the space taken by the Suites to other classes should help generate more revenues. Is it the best? It is certainly up there, but lacking the ‘wow’ social spaces of Etihad and Emirates. The seating on the premium upper deck certainly looks good enough that it will be no hardship for passengers to stay in their seats though.